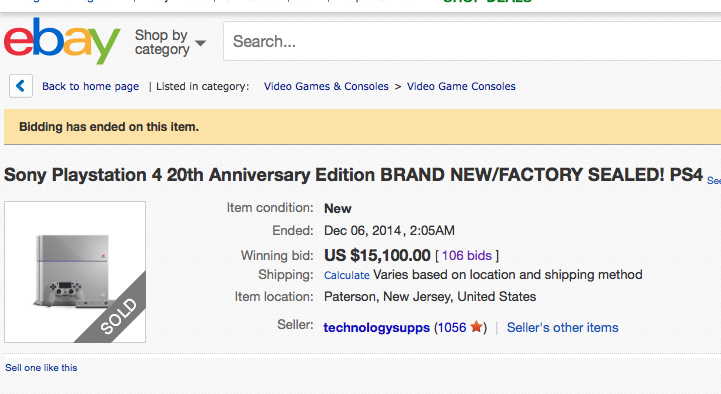 It looks like someone really wanted a grey PlayStation 4. A listing on eBay started at $0.99 and received 106 bids from 38 different bidders. The limited edition PlayStation 4 eventually sold for $15,100.00 (£9,700,00). This all happened over the course of a single day. Sony recently announced the special limited edition PlayStation 4 to celebrate PlayStation’s 20th birthday. The console is in the original PlayStation grey colour and comes with a camera, vertical stand and DualShock 4 controller in the same iconic grey finish. The original PlayStation was released on the 3rd of December 1994 in Japan. Only 12,300 units will be made and they are intended to be sold for around €499 in Europe. There is no word yet as to how much it will cost in the UK or where you can get your hands on one. Yet if this eBay listing is anything to go by, collectors and PlayStation fans will be clambering to get their hands on one of the special grey PS4 consoles.